There is no doubt about it, the internet has changed the world. For both good and bad, when it comes to food and nutrition, I am often baffled myself with all of the claims being made out there in print! Who can we trust? How can we make sense of it all!? As a Nutritional Health Counselor and Natural Foods Chef, I have been helping people discover the answers to the many questions challenging families today who want to embrace eating a health supportive diet. It is a learning curve, and with some education, you too can become a “food expert”, in fact you probably already are! Here are some important tips to help you on your road to vibrant health! 1.Make the Commitment to Yourself. So many times we say we want to change our eating habits but lack the follow through. Challenge yourself and set a period of time that feels attainable within your lifestyle. For example : “For the next 2 weeks I am going to write a food journal and see what I am really eating” or ” For the next week I am going to stay away from processed sugar and try to notice how I feel” Whatever your personal issue, find a meaningful goal and go for it! 2.Find the Support you Need. Whether you want to reach out to a Nutrition Expert for advice, take a cooking class, get friends or family together as a group challenge, try to create a winning atmosphere to achieve success. Everyone is at a different place on their food journey and I always say it is important to meet yourself where you are. If it’s food education you need, or help getting back on track, jump in and put your health at the top of your priority list! I know you can! 3.Read Ingredient Labels. When you buy foods that have a label, get out your reading glasses (seriously, have you seen how small the fonts have become?)! If you don’t know what an ingredient is then do some google research. Decide to be mindful of what you put in your body, and remember, there are many good choices out there so don’t settle for less than you have to! 4.Make a Cooking Plan. I am not suggesting you spend hours in the kitchen each day, or even each week for that matter. Shopping lists and gathering interesting recipes can be a time saver and stress reliever. Summer is a great time of year to expand your horizons! 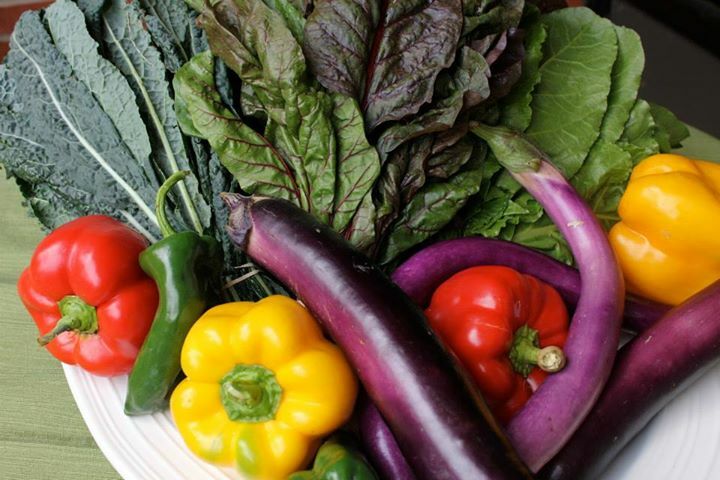 Visit your local Farmers Market and buy some of nature’s beautiful bounty of real foods! Check out our website if you can’t find one you like on hand. Plan a family meal and send out the invites! Cooking at home ensures that you can eat healthier, save money, and you might just find you have a happy and appreciative family as well! 5.Add a Rainbow of Colors to your Diet. Dark Leafy Greens, Tomatoes, Eggplants, Summer Squash, Onions, Garlic, Radishes, Fresh Herbs – these are all the foods I found at my Farmers Market this week in New York! Phytonutrients, fiber, vitamins, minerals, and energy! These are the foods that will prove the “Crowding Out Theory” I learned about in school. The premise being – when we add health supportive foods into our diet, it naturally “crowds out” the desire for unhealthy choices. Our bodies crave what makes it feel good! It really works! Most of all be kind to yourself and take time to smell the flowers! Summer is a wonderful time of year to catch up on needed rest and relaxation. We look forward to having you in class one day soon!